Happy February, friends! I know everyone’s been saying it, but I’ll say it again… January was a LONG month! I think the day after Christmas my mind has already switched gears to goal-setting and planning what’s ahead, so I accidentally add an extra week to the new year. But we made it, and it was a good month. So many good things were cultivated in January for so many people, myself included. I set some new routines and habits and I started becoming more intentional in certain aspects of my life. January is just such a great time for reflection and dreaming and planning, so it happens naturally. One of my favorite things that happened in January was my newfound love for a morning routine. I’m generally a “roll out of bed five minutes before you have to leave” type of person (which I hate), and so I’m trying to change that habit. And I found a fantastic way to kick that off with the Cultivate What Matters Fresh Faith Challenge. I knew that I wanted to be spending some time in prayer or in the Word in the mornings before work, and so the introduction of this challenge was the perfect addition to my blossoming morning routine! Basically, the challenge was to spend every single day in the Word for the month of January. 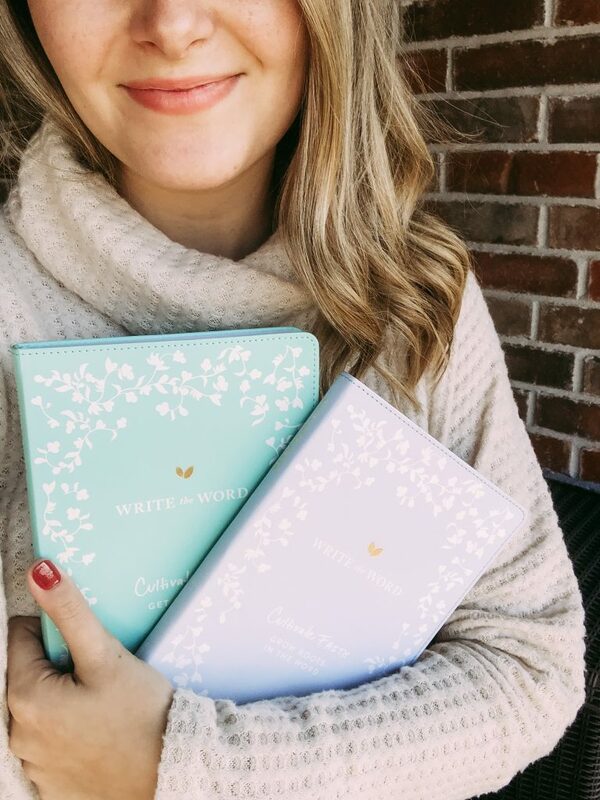 Whether this was using a Write the Word Journal or a blank notebook and your Bible, it doesn’t matter – the goal is just to get into God’s Word every single day. I received several Write the Word Journals for my birthday two years ago, and I’ve used them periodically, but this was the first time that I’ve really gotten into one of the journals and stuck with it day in and day out. I’ve been digging into the Cultivate Hope journal, and it’s been such a blessing for me, especially during this busy time where I’m constantly trying to remind myself to slow down. All of the scriptures in the journal are structured around a specific topic, and you write out the scripture and what you’re grateful for that day. There’s also a space to write what’s on your heart, whether it be a prayer, worries, fears, encouragement, anything! I loved this time to reflect on the passage that I just read and write a prayer for the day. I am not a morning person, y’all. So when my 6 am alarm goes off, it literally puts dread in my heart for the task of having to actually wake up and start my day. I could sleep 4 hours or 14 hours and I’m still going to feel completely tired and not ready for what’s ahead of me. BUT I turn off my alarm and I get up out of bed, put on my watch, and then get back into bed to start my morning with my Write the Word Journal and my Start Today Journal (I’m going to dedicate a full post to this one later on)! These two tools have really helped me set my heart and mind straight before I jump into my day. After my journaling, I sometimes read a chapter or two of whatever book I’m currently into or sometimes I just scroll on Instagram! Sometimes I’ll dig into my Powersheets or do a brain dump. Whatever it feels like I need to get prepared for my day. Then I’ll read some out of my Bible app and get ready for my work day! I’m still trying to get used to the waking up at 6 am thing, but I definitely think it’s worth it to spend some time with God before I start my day, and I’m hoping to continue that habit well into 2019 and beyond thanks to the Cultivate What Matters team!